Copyright: © 2018 Maurya H, et al. This is an open-access article distributed under the terms of the Creative Commons Attribution License, which permits unrestricted use, distribution, and reproduction in any medium, provided the original author and source are credited. Introduction: Before the experiment on kidney disorder, it is important to know the basic physiologies of the animal kidney because the anatomical and physiological features of the kidney are varying in different kind of experimental animals used for the basic study. This study focus on the variations in the nephron, a morphological process of podocytes, a path of the renal arteries, a position of the medulla and renal cortex are unusual in different animals. In human, middle and caudal lobe is larger while in rat small rounded cranial lobe present in comparison to other experimental animals. Statistically the mean length 10.40 ± 0.90 cm, width 4.20 ± 0.70 cm, thickness 1.5 ± 0.20 cm, and weight 136.71 ± 31.74 g; while in rat the mean length 1.54 ± 0.02 cm, width 0.85 ± 0.07 cm, thickness 0.73 ± 0.02 cm and weight 0.64 ± 0.03 g. Human has shorter loops of Henle, which dip only into the outer medulla while in monkey both the renal cortex and medulla are higher in numbers than in dogs. The renal lobule of mallard species was comparatively divided into two equal cortical and medullary regions while in chickens the cortical region was the larger as compared to medullary region resembling numerous mammalian types and few of swine type. In contrast, the severity of tubular degeneration, inflammation, fibrosis, tubular epithelial single-cell necrosis, and decreased normal parenchyma is responsible for proteinuria. The morphological process of podocyte development has been reported in the classic kidney of human, horse, goat, monkey, rabbit, cat, dog, chicken, medaka fish, rat and guinea pig indicating that it would be a good model system for studying renal regeneration. The kidney is a vital organ of the mammalian body and becomes a foremost subject of medical research because many renal diseases in humans are incurable when the kidney is severely damaged . It is also a primary target organ in preclinical studies, in which drug-induced nephrotoxicity is a recurrent finding in preclinical studies. In acute renal failure, the damaged tubular epithelium is repaired through repopulation, and tubular function recovers in most cases. The tubular epithelium is especially sensitive to toxic compounds because of water and solute absorption and active transport systems, which result in the concentration of toxicants in the tubular cells . The nephron is the functional unit of kidney and greatly varies in its structure amongst different vertebrates; also the formation of nephrons shows a variable degree of differences among species. In birds, the kidney has two kinds of nephrons; one is reptilian type and small sized, without loops of Henle, and other is mammalian type large in size with long or intermediate length loops . In contrast, the morphological process of podocytes development has been reported in the classic kidney of human, horse, goat, monkey, rabbit, cat, dog, chicken, medaka fish, rat and guinea pig indicating that, it would be a good model system for studying renal regeneration. The kidneys serve essential functions, such as filtration and excretion of metabolic waste products from the bloodstream, regulation of necessary electrolytes and stimulation of red blood cell production. They also serve to regulate blood pressure by the use of a renin-angiotensin-aldosterone system, controlling reabsorption of water, maintaining the correct pH level as well as chemical balance and intravascular fluid status of the body. The kidneys also reabsorb glucose and amino acids which may have involved in regulation of hormonal functions via erythropoietin, calcitriol, and vitamin D activation [4,5]. The glomerular corpuscle is a spherical structure in the renal cortex. Human glomeruli are all similar in size, but in rat juxtamedullary glomeruli are larger than glomeruli of the superficial cortex. The glomerular corpuscle generates an ultra-filtrate of plasma composed of water, electrolytes and small proteins [6,7]. The glomerular elements are a capillary network lined by a thin layer of endothelial cells, a central region of mesangial cells and a surrounding mesangial matrix, the visceral epithelial cells or podocytes and the parietal epithelial cells of Bowman’s capsule with associated basement membrane. The two epithelial layers are separated by a narrow cavity which receives the primary ultra-filtrate identified as Bowman’s space or urinary space. The poles are distinct as the vascular pole, where the afferent arteriole enters and efferent arteriole exits the glomerular tuft and the urinary pole where the parietal epithelium continues with the proximal tubule . The renal arteries are a pair of lateral branches arising from the abdominal aorta below the level of a superior mesenteric artery at the upper lumbar level (L1-L3) . Each renal artery divides into anterior and posterior divisions at or very close to the hilum of the kidney. Further, it split into segmental arteries to supply the respective segments of the organ and be converted into the end arteries [10,11]. The variation in renal arteries suggested itself into two groups’ i.e. early division and ERA (Extra Renal Arteries). The main renal arteries possess segmental branches extra proximally than the renal hilus level at the early division. The ERA is further divided into two groups’ viz. hilar (accessory) and polar (aberrant) arteries. Hilar arteries enter into kidneys from the hilum with the main renal artery, whereas polar arteries enter into kidneys directly from the capsule outside the hilum. Anatomically it is well defined that, the order of hilar structures from above to downwards and from anterior to posterior as a renal vein, renal artery and pelvis [12,13]. Usually, each kidney receives one renal artery. The venous drainage of each kidney is through one renal vein, which drains the blood from the kidney into the inferior vena cava. The left renal vein also receives left suprarenal and left gonadal veins, in addition to the vein coming out from the organ. Variations in number, source and path of the renal arteries are unusual in each animal (Figure 1) . Figure 1: Kidney anatomy and pathway of urine drainage. Awareness of the changes of renal vascular anatomy has importance in exploration and treatment of renal trauma, renal transplantation, and renal artery embolization, surgery for the abdominal aortic aneurysm, conservative or radical renal surgery (Table 1) [15-25]. Table 1: Anatomical similarities of the kidney of different experimental animals. Kidneys possess large numbers of loops which are capable to forming concentrated urine, whether it also acquires small amounts of long loops that occupy in the production of diluted urine released from the renal corpuscles near to the medulla [26-28]. The short loops initiate from the renal corpuscles located near the exterior part of the kidney are known as subscapular nephrons whereas very long loops are intermittently extending nearly to an apex of the papilla. Dogs and cats have long loop nephrons and consequently producing concentrated urine. The renal glomerulus, a tuft convoluted capillary forms the central structure of the renal corpuscle [29,30]. The glomerulus of a kidney is surrounded by glomerulus capsule where the renal visceral layer formed by podocytes which envelope the glomerular capillary with a parietal layer formed from the simple squamous epithelium. The filtration barrier presented between the two layers of urinary space including glomerular capillary, endothelium, basement membrane and the slit diaphragm between the podocytes . The packed glomerular capsule empties into the proximal tubule to maintain the urinary space. The proximal tubule matured with cuboidal epithelium and entirely developed apical border of microvilli. The tubules continue as the thin tubule which is lined by simple squamous epithelium with a spherical nucleus and protrude into the lumen . The distal tubules extend from the thin tubules as a straight segment passes at the pole of the renal corpuscles and end as the convoluted segment before emptying into the collecting duct lined merely by cuboidal epithelium. The epitheliums cells change the shape from protruding to a lumen or retract, mostly depend on the secretory state . Urine is the wastage of by-product formed through excess water and waste molecules during the metabolic process of renal system filtration. The primary purpose of the renal system is to regulate blood volume, maintain plasma osmolarity and removal of wastage via urine, which is mostly a convenient way to performs many body functions (Figure 2). 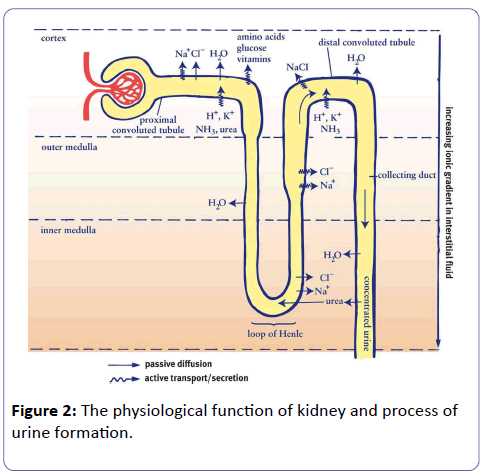 Figure 2: The physiological function of kidney and process of urine formation. Filtration: During filtration, blood enters the afferent arteriole and flows into the glomerulus where filterable blood components, such as water and nitrogenous waste, moves towards the inside of the glomerulus, and non-filterable components, such as cells and serum albumins, exit via the efferent arteriole. These filterable components accumulate in the glomerulus to form the glomerular filtrate. On average, about 20% of the total blood pumped by the heart per minute enters into the kidneys to undergo filtration. The remaining 80% of the blood flows throughout the body to facilitate tissue perfusion and proper exchange of gas. Reabsorption: During reabsorption, molecules and ions present in the blood will be reabsorbed into the circulatory system. The fluid passes through the components of the nephron (i.e. proximal/distal convoluted tubules, the loop of Henle and collecting duct) as water and ions are removed due to the change in fluid osmolarity (ion concentration). In the collecting tube, secretion will occur before the fluid leaves the ureter in the form of urine. Secretion: During secretion, some substances such as hydrogen ions, creatinine, and drugs will be removed from the blood through the peritubular capillary network into the collecting duct. The end product of all these processes is urine, which is mostly a collection of substances that have not been reabsorbed during glomerular filtration or tubular reabsorption process . The histological observations of kidney sections from the demonstrated experimental animals depend on pathological circumstances such as congestion of blood vessels, focal interstitial haemorrhage, a complication in nephrons and glomerular haemorrhages [18,19,23-25,35-40]. Nephrotic syndrome is a common symptom of kidney disease and becomes a global health burden with a high economic cost to healthcare systems with an independent risk factor for cardiovascular disease. It is usually asymptomatic until later stages, and accurate prevalence data are lacking so it will difficult to determine the prevalence of kidney disease globally, by stages, geographical location, genders and age [41,42]. The kidney anatomies of different animal have variation in descriptions of the collecting system of the renal pelvis especially about the extensions of the renal pelvis into the poles of the kidneys. Tubular extensions of the renal pelvis into both kidney poles have been described as either progressively tapering terminal recesses or more narrow tubules. The renal pelvis of the horse consists of a large central compartment into which urine from the mid-portion of the kidney empties via numerous papillary ducts exiting on the renal crest [43,44]. Similarities between human disease and animal models might have resulted in promising preclinical therapies failing to be effective in clinical trials. The rats have been continually playing a significant role in the identification of critical genes that enhancing disease susceptibility, of early biomarkers that highlight disease progression, and of genes, pathways and cells that are fundamentally involved in the restoration of kidney function. Despite the fact that the complexity of renal pathologies are a better design with the use of rat models as a resource might ultimately result in stratification of diagnosis and tailored therapy [45,46]. 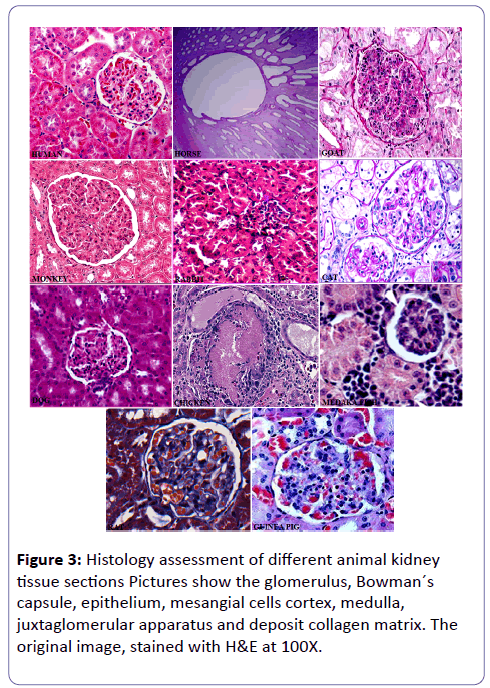 Histologic variables that were significantly different among stages affected the interstitial, tubular, and glomerular compartments in all experimental animals. As it concerned multiple species, it allows interspecies comparison and may help translational validation. In case of nephrotoxicity, immunohistochemical expression of these antigens may be decreased or modified, and identification of the targeted nephron segment may become difficult. Kidney showed fibrosis of glomerular tuft-forming homogenous pinkish mass and narrowing of urinary space along with these changes also reported periglomerular fibrosis. No antibody is dedicated to the identification of the thin ascending limb of the Henle’s loop, and AQP-1 staining does not permit to discriminate the different parts of the proximal tubule (convoluted part, straight part, and thin part). Alpha-GST antibody does not react with mouse and Cynomolgus monkey tissues (Figure 3) [47,48]. Figure 3: Histology assessment of different animal kidney tissue sections Pictures show the glomerulus, Bowman´s capsule, epithelium, mesangial cells cortex, medulla, juxtaglomerular apparatus and deposit collagen matrix. The original image, stained with H&E at 100X. Grossly, glomerulosclerosis kidneys were enlarged, fibrosis, pale grey, hard and cut with difficulty. On microscopic examination, kidney showed fibrosis of glomerular tuft-forming homogenous pinkish mass and narrowing of urinary space along with these changes also reported periglomerular fibrosis. The glomerular response to injury is a vast chapter of kidney anatomy and pathology that should be understood in each specific case regarding the aetiology. This approach aims to be a starting point for novels with pathology demands [49,50]. The study credentials differences in anatomy, physiology and histological patterns among experimental animals. The investigational parameters like tubular degeneration, interstitial inflammation, fibrosis, and glomerulosclerosis were considered as significant changes occur during advance stages of chronic kidney disease compared with early stages of the disease. These findings will help out to identify therapeutic targets and the stages of disease at which they should be initiated. Based on histopathology and medical imaging findings, between animal models and human kidney disease might have resulted in promising preclinical therapies failing to be effective in clinical trials. Recent developments in genome engineering and transcriptomic profiling now allow the researcher to design and refine models, to more closely interrogate specific aspects of renal disease. The animal models continuously play a significant role in the identification of critical genes and early biomarkers that increase disease susceptibility, highlight disease progression, pathways of cells that are fundamentally involved in kidney regeneration or damage. We were thankful to the Director of Department of Pharmaceutical Science, Bhimtal campus, Kumaun University Nainital, (UK) for providing us such type of facilities to do our work peacefully. The authors declare no potential conflicts of interest concerning the authorship, or publication of this review article. Fedorova S, Miyamoto R, Harada T, Isogai S, Hashimoto H, et al. (2008) Renal glomerulogenesis in medaka fish, Oryzias latipes. Develop Dyn 237: 2342–2352. Pazhayattil GS, Shirali AC (2014) Drug-induced impairment of renal function. Int J Nephrol Renovasc Dis 12: 457-468. Lentine KL, Kasiske BL, Levey AS, Adams PL, Alberú J, et al. (2017) KDIGO Clinical practice guideline on the evaluation and care of living kidney donors. Transplant 101: S7–S105. Yoldas A, Dayan MO (2014) Morphological characteristics of renal artery and kidney in rats. Scient World J 1-7. Gaschen L, Menninger K, Schuurman HJ (2000) Ultrasonography of the normal kidney in the cynomolgus monkey (Macaca fascicularis): morphologic and doppler findings. J Med Primatol 29: 76-84. Khan H, Muhammad MR, Ahmad R, Ahmad N, Shah G, et al. (2003) Gross anatomical study on normal kidneys of adult goat. J Anim Vet Adv 2: 539-541. Anderson JK, Kabalin JN, Cadeddu JA (2007) Surgical anatomy of the retroperitoneum, adrenals, kidneys and ureters. Campbell-Walsh Urology, Saunders, Philadelphia 24-32. Bariety J, Mandet C, Hill GS, Bruneval P (2006) Parietal podocytes in normal human glomeruli. J Am Soc Nephrol 17: 2770-80. Standring S (2005) Gray’s anatomy- The anatomical basis of clinical practice. Elsevier Churchill Livingstone, New York 1271-1274. Rao TR, Rachana (2011) Aberrant renal arteries and its clinical significance: a case report. Intl J Anatom Var 4: 37-39. Onyeanusi BI, Adeniyi AA, Onyeanus CG, Ayo JO, Ibe CS, et al. (2009) A Study of the kidney of the wistar rat in northern guinea savannah zone: The morphometric aspect. Pak J Nutr 8: 1040-1042. Arora AK, Verma P, Lalit M, Mahajan A, Sharma M, et al. (2012) Variant segmental renal arteries in the right kidney- clinical correlations- A case report. Anat Physiol 2: 1-3. Nayak BS (2008) Multiple variations of the right renal vessels. Singapore Med J 49: e153-55. Bergman RA, Cassell MD, Sahinoglu K, Heidger PM (1992) Human doubled renal and testicular arteries. Ann Anat 174: 313-315. Gupta V, Kotgirwar S, Trivedi S, Deopujari R, Singh V, et al. (2010) Bilateral variations in renal vasculature. Inter J Anato Var 3: 53-55. Mochizuki E, Fukuta K, Tada T, Harada T, Watanabe N, et al. (2005) Fish mesonephric model of polycystic kidney disease in medaka (Oryzias latipes) pc mutant. Kidney Inter 68: 23-34. Buchholz NP, Abbas F, Biyabani SR, Afzal M, Javed Q, et al. (2000) Ultrasonographic renal size in individuals without known renal disease. J Pak Med Assoc 50: 12-16. Menzies-Gow N (2007) Diagnostic endoscopy of the urinary tract of the horse. In Practice 29: 208-13. Dutta S, Rahman SQ, Azmi S, Prawez S, Kour N, et al. (2016) Patho-morphological changes in kidneys of slaughtered sheep and goats in jammu region. J Animal Res 6: 705-709. Sartor R, Müller TR, Mamprim MJ, Teixeira CR, De Souza LP, et al. (2017) Abdominal ultrasonography of the healthy howler monkey Alouatta fusca. Vet Med Sci 3: 32-39. Espinosa G, López Farré A, Cernadas MR, Manzarbeitia F, Tan D, et al. (1996) Role of endothelin in the pathophysiology of renal ischemia-reperfusion in normal rabbits. Kidney Inter 50: 776-782. Stocco AV, Santos Sousa CA, Gomes MS, Souza Junior P, Abidu Figueiredo M, et al. (2016) Is there a difference between the right and left kidney? A macroscopic approach in Brazilian Shorthair Cat. Arq Bras Med Vet Zootec 68: 1137-1144. Pereira-Sampaio MA, Marques-Sampaio BP, Henry RW, Favorito LA, Sampaio FJ, et al. (2009) The dog kidney as experimental model in endourology: Anatomic contribution. J Endourol 23: 989-993. Dhyaa AA, Ali FR, Azhar SK, Ahmed MA (2014) Comparative anatomical and histological features of the kidney in Harrier (Circus aueroginosus), Chicken (Gallus domesticus) and Mallard duck (Anas platyrhynchos). Ira J of Vet Med 38: 107-113. Fedorova S, Miyamoto R, Harada T, Isogai S, Hashimoto H, et al. (2008) Renal glomerulogenesis in medaka fish, Oryzias latipes. Dev Dyn 237: 2342-2352. Mullins LJ, Conway BR, Menzies RI, Denby L, Mullins JJ, et al. (2016) Renal disease pathophysiology and treatment: contributions from the rat. Dis Model 9: 1419-1433. Sampaio FJ, Pereira-Sampaio MA, Favorito LA (1998) The Pig Kidney as an Endourologic Model: Anatomic Contribution. J Endourol 12: 45-50. Satyapal KS, Haffejee AA, Singh B, Ramsaroop L, Robbs JV, Kalideen JM, et al. (2001) Additional renal arteries: incidence and morphometry. Surg Radiol Anat 23: 33-38. Pereira-Correia JA, Valentim LS, Castro KF, Gasque GP, Celina AF, et al. (2009) Analysis of renal hilum extraparenchymal structures in Brazilian adult human cadavers. Eur J Anat 13: 145-53. Saldarriaga B, Pinto SA, Ballesteros LE (2008) Morphological expression of the renal artery. A direct anatomical study in a colombian half-caste population. Int J Morphol 26: 31-38. Menon MC, Chuang PY, He CJ (2012) The glomerular filtration barrier: components and crosstalk. Int J Nephrol 1-9. Ali FB, Ghazi Abd AH, Zaid Abd K (2014) Histological study to the nephrons of the kidney in Dogs (Canis familiaris) in middle of Iraq. Kufa J Vet Med Sci 5: 98-103. Aktas RG, Karabay G, Taskinalp O, Kutlu AK (2010) Electron microscopic evaluation of the secretory mechanisms of renin from juxtaglomerular cells. Int J Morphol 28: 723-28. Feher J (2017) 7.5 – Mechanism of concentration and dilution of urine-An introduction. Quantitative Human Physiology (Second Edition): 730–739. Ana Calado (2013) Introduction to the renal histopathology the glomerular evaluation by routine optic microscopy. Exper Pathol Health Sci 7: 19-24. Mazué G, Newman AJ, Scampini G, Della Torre P, Hard GC, et al. (1993) The histopathology of kidney changes in rats and monkeys following intravenous administration of massive doses of FCE 26184, human basic fibroblast growth factor. Toxicol Pathol 21: 490-501. Mc Leland SM, Cianciolo RE, Duncan CG, Quimby JM (2015) A comparison of biochemical and histopathologic staging in cats with chronic kidney disease. Vet Pathol 52: 524-534. Bauchet AL, Masson R, Guffroy M, Slaoui M (2011) Immunohistochemical identification of kidney nephron segments in the dog, rat, mouse, and cynomolgus monkey. Toxicol Pathol 39: 1115-1128. Ahmed RA (2017) Histological assessment and quantification of hypervitaminosis A-induced fibrosis in liver, kidney and testis of albino rats. World J Pharm Sci 5: 209-220. Boehmer E, Crossley D (2009) Objective interpretation of dental disease in rabbits, guinea pigs and chinchillas. Tierärztliche Praxis Kleintiere 37: 250-260. Inayat Q, Ilahi M, Khan J (2007) A morphometric and histological study of the kidney of mice after dermal application of cypermethrin. J Pak Med Assoc 57: 587-591. Maurya H, Kumar T (2017) Clinical Assessment of Drugs used in Nephrotic Syndrome. Annals Pharmacol Pharm 2: 1-2. Kumar R, Kumar T, Kamboj V, Chander H (2012) Pharmacological evaluation of ethanolic extract of Kigelia pinnata fruit against ethylene glycol induced urolithiasis in rats. Asian J Plant Sci Res 2: 63-72. Maurya H, Kumar T (2016) A review on comprehensive overview in the management of nephrotic disorders. J Crit Rev 3: 34-43. Mullins LJ, Conway BR, Menzies RI, Denby L, Mullins JJ (2016) Renal disease pathophysiology and treatment: contributions from the rat. Dis Models Mech 9: 1419-1433. Parmar N, Rawat M, Kumar T (2012) Evaluation of anti-inflammatory potential of Kigelia pinnata leaf extract in wistar rats. Asian J Pharm Clin Res 5: 95-97. Huang J, Wu H (2017) Drug-induced nephrotoxicity: pathogenic mechanisms, biomarkers and prevention strategies. Curr Drug Metab 18: 1-9. Maurya H, Gandhi S, Kumar P, Upadhyay G, Kumar T (2014) Nephroprotective potential of Curcuma caesia roxb in animal model. Int J Bioassays 3: 3336-3341. Arsad SS, Esa NM, Hamzah H (2014) histopathologic changes in liver and kidney tissues from male sprague dawley rats treated with Rhaphidophora decursiva (Roxb.) Schott extract. J Cytol Histol 4: 1-6. Maurya H, Kumar T (2016) Antinephrotic potential of CATCAB-50 in CCL4 induced glomerulonephritic animal. Int J Pharm Med 4: 324-328.